“Our collaboration with Pimar on the construction of the Lewis Arts Complex for Princeton University has resulted in the creation of a new set of splendid buildings based on a project that was awarded the ‘Building of the Year’ recognition by the “Architect’s Newspaper”. 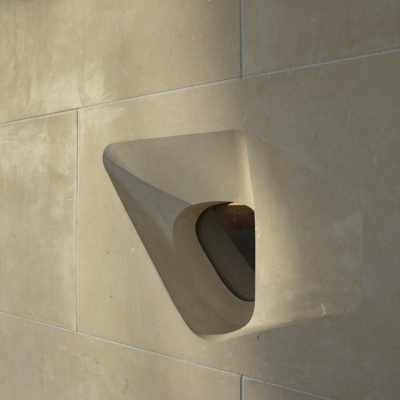 We will all be enthusiastic about having an opportunity to work with Pimar great team in future, and make use of their Lecce stone, a very stimulating material” – Steven Holl. 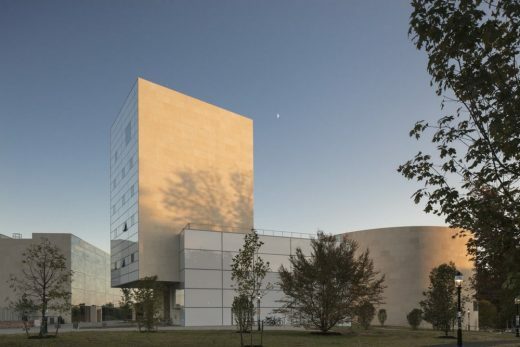 The grandiose Lewis Arts Complex designed by Steven Holl for Princeton University was born of a need to create a space entirely dedicated to the creative arts, such as dance, music and the theatre. Three, in fact, are the new buildings that extend over an area of approx. 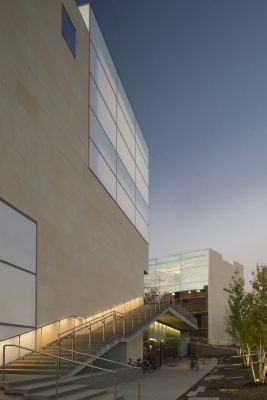 13,000 m2: the Wallace Dance Building and Theatre, a round body enclosing the theatre and dance halls; the Arts Tower, a central tower that hosts the facilities dedicated to literature and the visual arts, and the New Music Building, a square-shaped structure reserved for music. 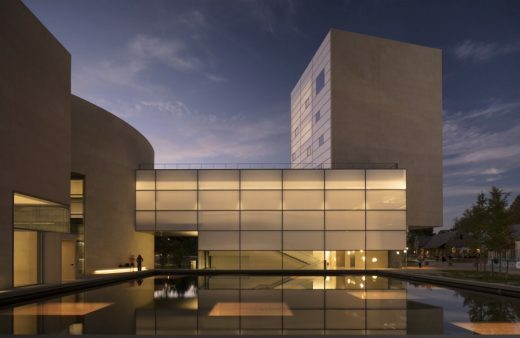 In this project, besides experimenting with diversified architectural forms, Steven Holl enjoys juxtaposing different materials and using light effects in a particularly interesting way, as if light was a surface. 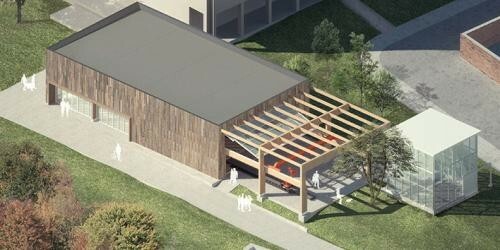 i.e., a structural component of the building. Alongside glass, which he uses to explore most effectively the interaction between exterior and interior, the architect opted for a highly “stimulating” cladding material, of great fascination: Pimar natural stone. 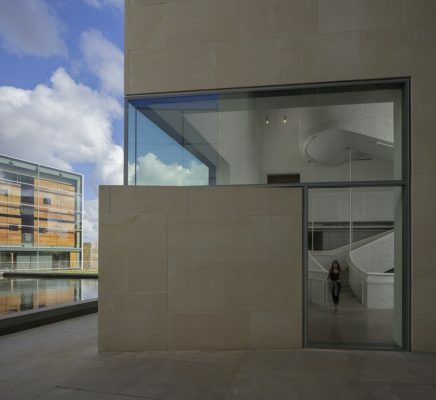 The prestige and the light of Pimar natural stone give the Lewis Arts Complex an unusual degree of luminosity, thanks to the beige-coloured natural stone, which goes perfectly well with all the other materials: glass, concrete, wood. 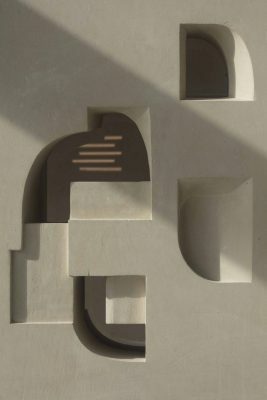 Flat and curved slabs, all of them measuring 90x150x7.5 cm, were used to clad an overall facade area of 4,000 m2, while special pieces were used for the corners and decorations with cavities carved in the stone. The architect visited Pimar quarries and personally selected the portion of the quarry to be used in the Princeton University complex, with a view to maintaining high quality standards and consistency in terms of technical features and uniformity of colour of the stone. Pimar supported the project in each and every stage of development: design, preparation of the stone slabs in the form of huge modules, as requested by the architects and in accordance with the management needs of logistics and transportation services and site organisation. The evaluation and selection of the natural stone elements proceeded in parallel with an analysis of different anchoring methods: thanks to its expertise in such matters, Pimar contributed to the choice of anchoring system, in coordination with a number of leading companies specialising in the study of mechanically anchored stone facades. At this stage, Pimar set up a team of professionals with the task of designing and dimensioning the various steel anchors to be used to secure the stone slabs to the facade of the buildings making up the complex. They were also responsible for determining the shape and geometry of each element. An overall facade area of more than 4,000 m2 was clad with flat and curved slabs, special corner pieces, and decorated elements with cavities carved in the stone. The anchoring system selected consisted of anchors secured to the load-bearing support in reinforced concrete by interposing a layer of insulating material and an air gap, as is typical of ventilated stone facades. Each single slab is secured by 4 brackets independently, so that its weight (of over 220 kg) does not bear down on the adjoining cladding elements, making for maximum stability. The dimensions of the anchors and the slits in the stone (kerfs) necessary to install them were determined and verified by specialised partners. Pimar also produced in-house a number of mockups that were used to verify the functionality and safety of the anchoring system.